This invasion threatens to wrest control of a crucial port city, seize a third the country’s natural gas and oil reserves, and make refugees of hundreds of thousands of Americans. Would that constitute a national emergency? What if that foreign body was a body of water? This is the reality in the deep south, where along the Louisiana coast the United States is loosing ground to climate change at a staggering rate. The Mississippi River delta, one of the most dynamic coast lines in existence, is sinking into the Gulf of Mexico faster than any other land mass in the world—nearly sixteen square miles every year, or one football field every hour.If Louisiana’s wetlands are not repaired, and sea levels continue to rise as they have, by 2050, the southern half of Louisiana, including New Orleans, will be underwater. The River Delta (not to be confused with the cultural “Mississippi Delta” in western Mississippi) is in a constant state of flux, building up land as sediment flows down river, and then altering course. Roughly every millennium the river has moved, building out southern Louisiana over the last seven thousand years. As the river changes course, some of the old soil deposits are pulled out to sea leaving the swamps and bayous that make up Louisiana’s unique ecosystem. This process, called avulsion, has given shape to the tentacled coastline that forms a crucial barrier to flooding from hurricanes and rising sea levels. The coast is also home to some of the most productive fisheries in the United States, a major portion of the nation’s energy reserves, and serves as a buffer for one of the most iconic cities in the world, New Orleans. That land has rapidly disappeared over the last century, largely because the delta it’s built on has been sliced up by canals and starved of replenishing river sediment. As the levee system was built in the 1930’s to protect river communities from flooding, crucial sediment was redirected away from the swamps and out to sea. During that same time, the discovery of large deposits of oil and gas under the soil encouraged the construction of roads, canals, wells, and pipelines that further disrupted the balance between the river and the Gulf of Mexico. Nearly 213,000 miles of pipeline have been laid across Louisiana and its coast line. Natural gas and oil, along with fishing have been a major boon for the country. Louisiana Highway 1 alone directs the flow of 90% of all offshore oil production, and Louisiana’s commercial fisheries provide 25-35% of the domestic seafood consumed in the US. Supporting the nation’s energy and food demands have come at a significant cost. Since 1932, 25% of Louisiana’s coastline has disappeared. Nearly 2,000 square miles—roughly the size of the state of Delaware—are gone. This has occurred due to the disruption of fragile swamp and marsh ecosystems. Canals and construction have welcomed an influx of salt water from the Gulf into the fresh-water habitat, choking off local plant life. As the vegetation dies, the soil becomes unstable. As oil and gas are pumped from the ground, the soil is further disrupted and eventually sinks and is pulled out to sea. The loss of land in Louisiana accounts for 90% of the total coastal wetland loss in the continental United States. It is quite literally a one of the biggest environmental disasters in the world. “It happened so fast, I could actually see the difference day-to-day, month to month,” said Ryan Lambert, a fishing guide in Buras, Louisiana. Buras is literally falling off the map. Fishermen heading to the Gulf of Mexico from Buras once had to cross five unique bays, navigating around thick marsh, cypress swamps and ridges. A thriving community of year-round fishing camps existed here. Now, all of those bays and swamps are gone, and the fishing camps gone with them. 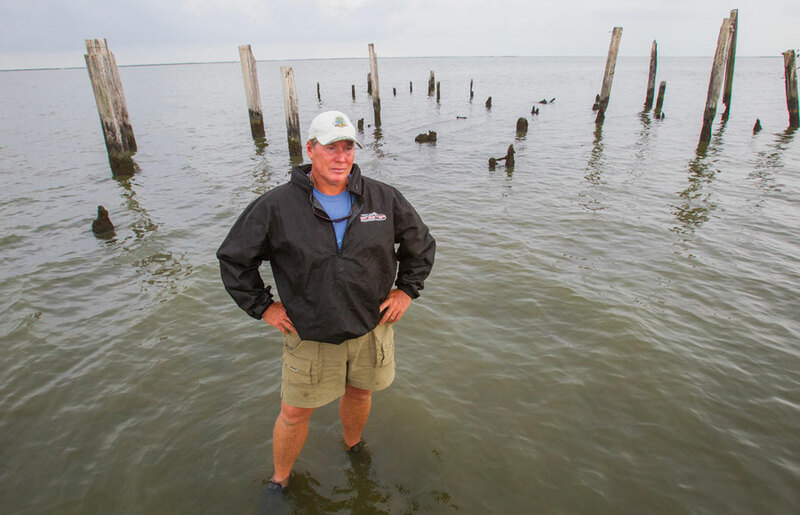 Buras, once 6 miles off the Gulf, now literally sits on top of it. Thirty-one locations have been removed from the National Ocean and Atmospheric Administration’s (NOAA) navigation charts because they no longer exist. As sea levels continue to rise, Louisiana continues to disappear, and not just along the coast. Inland areas like Lafitte and Delacroix are now almost entirely submerged, and along the coast of Lake Pontchartrain just north of New Orleans, sea level rise is among the highest rates in the world—nearly half an inch every year (Marshall, 2013). This is not a prognosis. This is the reality of climate change. The United States is losing this battle. Frankly, we’re barely even in the fight. The newly elected Trump administration has put a gag order on climate science and intends to drastically cut funding to the Environmental Protection Agency and other departments tasked with solving this national emergency. Louisiana has a plan to fight back, but without scientific and monetary support from the government, catastrophic losses to the nation’s food and energy supply will become a sinking reality. According to a recent study, coastal counties and parishes in Alabama, Mississippi, Louisiana, and Texas already face significant losses that annually average $14 billion from hurricane winds, land subsidence, and sea level rise. Future projections estimate these costs could rise to nearly $23 billion by 2030. By comparison, the cost of physical damage to New York City after 9/11 was around $25 billion. It is time to step up to the plate, as Americans, and stand up for the land so many generations have fought and bled to keep to keep. If we don’t it will be swept away right from under our noses, and all of those who came before us will have given their lives for a lost cause.